Murakami is best known for his magical realism, novels that transcend the everyday world and enter universes that only he can imagine. Yet despite this, his writing speaks volumes about the plain old human condition – characters who are isolates and seek to reach out to those around them. 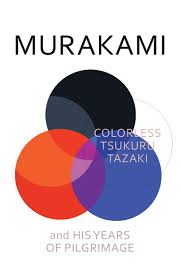 In Colorless Tsukuru Tazaki, like Norwegian Wood, he leaves behind the magical realism and focuses instead of the inner world of his main character. Tsukuru Tazaki is a loner – but he wasn’t always. He was once in a tightly-knit group of five, who grew up together in Nagoya. Each member of the group, excluding Tsukuru, had a surname associated with a colour. This made Tsukuru always feel a little on the outer, the colourless and dull member of the group. One day, after he has left Nagoya to study in Tokyo, he finds that all his friends have abandoned him. They never speak to him again. Sixteen years later, he meets a woman he believes he could be close to. She encourages him to find out what happened all those years ago, and finally put his years of pilgrimage to rest. Its a finely crafted novel of deep personal insight. Many call Murakami the finest novelist of our time, and this is yet another exquisite example of his spare but purposeful prose. I prefer the novels with a bit of magical realism, Kafka on the Shore being one of my favourites of all time, but this was still a hauntingly beautiful read. My only sadness is that it will be years before we get another.